New Holland PLM IntelliTurn works with PLM IntelliSteer to provide hands-free steering for automatic, repeatable end-of-row turns – maximizing a vehicle’s turning accuracy and overall efficiency while reducing operator fatigue. PLM IntelliTurn improves yield potential by ensuring agronomically correct field layouts that can be precisely followed during every phase of the crop production cycle. 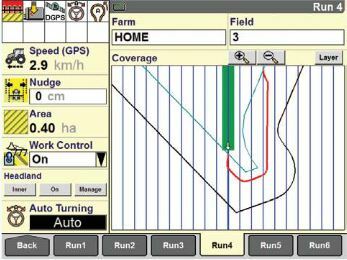 *PLM Intelliturn is compatible with New Holland 2011 – current model vehicles. Vehicles must be equipped with PLM Intellisteer and include an IntelliView IV display, New Holland 262 / 372 receiver and a NAV II / NAV III controller. For more information about the New Holland PLM IntelliTurn, call our Ag Technologies location (1268 E 100 S Rochester, IN 46975) at 574-223-2714.